Halfway through the 2018 season, the Sounders remain a team seeking an identity. The squad that managed a scoreless draw at New England on Saturday won’t be entirely the same one that finishes the season. And to have that season extend beyond October, the Sounders must play their final 17 matches a whole lot better than the initial 17. The playoff math isn’t pretty: At just 16 points in 17 contests, the Sounders must replicate their second half runs of the two prior seasons just to have a chance at the minimal 46-point threshold that could be required to secure a playoff position. That’s the point total a sixth-place finish in the Western Conference required last year. But there’s an excellent chance the postseason might require 48 or even 50 points this time, given the records of the Houston Dynamo and Los Angeles Galaxy, who trail No. 6 Vancouver but have multiple games in hand. “We need every point we can get,’’ Sounders coach Brian Schmetzer said after the draw at New England. More importantly, they need to up their game. While Schmetzer praised his team for not quitting Saturday in a game few expected the Sounders to win, they need to go beyond draws and nail some surprise victories to catch the squads ahead of them. It’s popular to point to the team’s 2016 and 2017 finishes as proof they’re capable of another late run. But they’ve yet to display the same ability level as those two prior editions. Last year’s team recorded five shutouts by the halfway mark – en route to a franchise record 13 – but this year’s has only two. They’ve also been held scoreless nine times already compared to only four by this point last year. The Sounders last season lost only one game at home – to eventual champion Toronto – compared to four defeats already at CenturyLink Field. They scored 20 goals in their first 17 matches a year ago, but only 15 this time around. Their 4-9-4 record and 16 points lags the 5-7-5 mark and 20 points from last season after 17 matches. As well, beyond mere numbers, there is the identity question. For the past two seasons, the offensive leader when healthy was Clint Dempsey. He banged home a dozen goals last year and helped carry things in the playoffs. This year, Dempsey has just one goal. Schmetzer on Tuesday called Dempsey “a team guy” while hinting he might be used off the bench more once reinforcements arrive. Another difference last year was the Sounders having Joevin Jones as a dual-threat left back controlling play on the flank. He had a goal and 11 assists and was bumped up to left wing for added attack presence late in the season while Nouhou filled in at left back. This year, the combination of Nouhou and Waylon Francis at left back has disappointed, combining for just one assist and getting burned down the left side at key moments. Nouhou is experiencing the trials of many second-year players. Even right back Kelvin Leerdam has not been the lockdown player that he was from July onward last season. Whether because of an early red card suspension that effectively knocked him from two matches, or a pair of injuries that sidelined him extensively, Leerdam has yet to get his game fully clicking. Last year, the team hit big on mid-summer targeted allocation money (TAM) additions Leerdam and Rodriguez, while pre-season signing Svensson looked like a first-half MVP. This year, winter-signing Francis has struggled while midfield TAM addition Magnus Wolff-Eikrem has a lone goal, one assist and just a half dozen starts. TAM center back Kim Kee-hee missed six weeks due to injury and has been adjusting to MLS play. Center back Roman Torres has been banged up much of the year when not on World Cup duty with Panama. Torres sprained his ankle in his final World Cup game and his immediate status remains doubtful, leaving Kim and veteran Chad Marshall to handle the bulk of the defensive load. Svensson’s return from World Cup play should provide needed defensive midfield help – possibly by this weekend – given how Osvaldo Alonso looks to have lost a step. As for mid-summer reinforcements, it remains to be seen whether they’ll have as big an impact as in prior years. The biggest change should be new Peruvian striker Raul Ruidiaz, brought in to aid the league’s second-worst-scoring attack. That Will Bruin leads the team with five goals and nine points might be the biggest indicator of how the team’s preseason plans imploded, given he’d been expected to play only a secondary forward role. But main striker Jordan Morris was lost for the year while midfielders Nicolas Lodeiro and Rodriguez were been slowed by injury and have not contributed as envisioned. Neither Lodeiro nor Rodriguez seems primed to carry the squad. Lodeiro famously picked the team up in the second half of 2016 and led the Sounders to their only championship while Rodriguez was an underrated component of last year’s finals run. 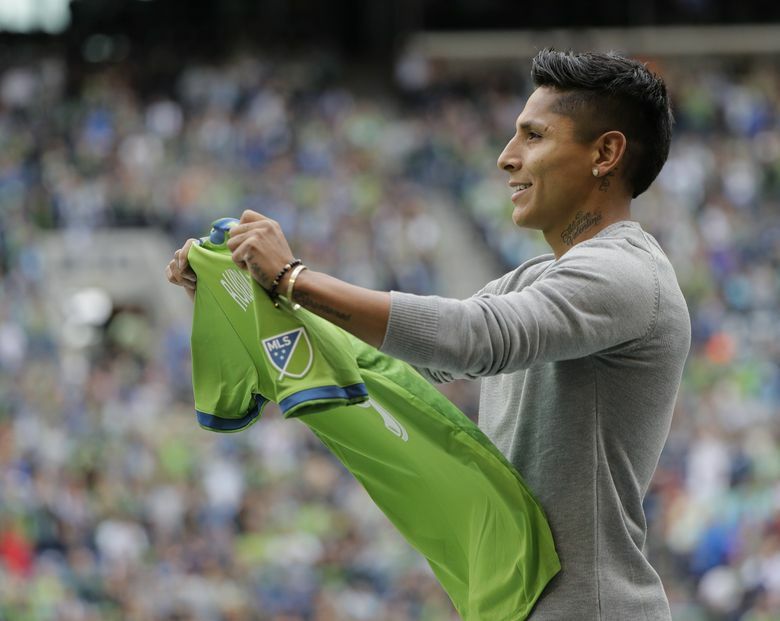 Instead, reigniting the Sounders in 2018 falls to Ruidiaz, who has yet to play a game. With goalkeeper Stefan Frei still making game-stealing saves – like in Colorado last week to preserve a rare win – the team’s fortunes could swing quickly if Ruidiaz can score regularly. If his government-issued paperwork is completed on time, Ruidiaz could play part of Sunday’s game at Atlanta. Those details and others need to be ironed out fast. With only 17 games to go, the Sounders have almost no leeway left to figure out what they are and who will get them where they need to be.